In this fall’s mind-bending sci-fi movie, “Arrival”, a group of American scientists, including a top-notch linguist played by actor Amy Adams, tries to learn an alien language and to teach English to the Aliens. A critical take-away of the movie is the importance of interpretation of written language. In this case the interpretation of a single word, “weapon”. America’s science team pleads with the CIA and armed forces that “weapon” can have numerous meanings – as in gift, or item, or tool. This nuance becomes critical when other more militaristic and belligerent nations take the meaning of the word literally and begin the necessary preparations to defend against an impending interplanetary war. 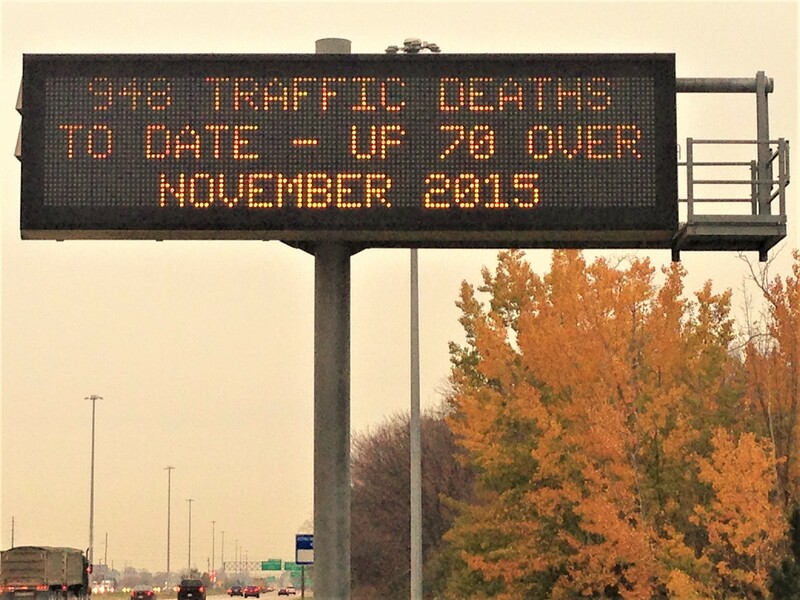 In a similar way, the electronic notices shown on Michigan’s dynamic message signs dotting major roadsides need interpretation. 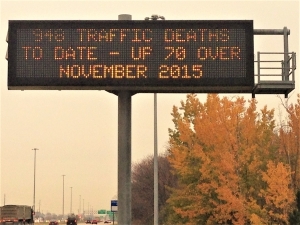 In the image above, drivers see that in 2016 we are 70 fatalities ahead of last year. Here we are only being told part of the story. Clearly, the number of fatal crashes relates to the amount of driving done – vehicles miles traveled (VMT) as traffic engineers would say. Putting aside for the moment that fatal crashes are a horrible thing, are we to assume that an increase in the absolute number of fatal crashes this year versus the same time last year is a bad thing? Drivers need to know VMT to arrive at a suitable understanding. For example, if we learned that VMT doubled this year and fatalities increased 10% over 2015, we could interpret this to be a victory for safe driving education efforts. Without knowing the context of the statistic, it is difficult for us to know if we are succeeding or failing in our war against fatal car crashes. Given the above, the interpretation is that 2016 traffic fatalities in Michigan have increased at a slightly higher rate than VMT over the same time period in 2015. Just like the scientists in the movie “Arrival”, Michigan’s driving public needs more information to draw thoughtful conclusions. Anything less and we’re just guessing.